War is still raging in Gaza and Israel, and right now, it looks like it can only get worse as each attempted ceasefire begins and is promptly discarded. Scores are dying, many of them civilians. But how many are civilians? How can we find out? The answer we found is far different from the official one. Civilian or not, no matter which side, the dead leave behind families, friends, and loved ones. But in a world that seems obsessed with keeping score about everything, whether it's polling data or conflict, the only thing that can truly permeate is data and raw numbers. Israel is being criticized for the "slaughter of innocents," with accusations that it has a blatant disregard for civilian life, and is only interested in wholesale murder. As of this writing, the United Nations is saying that 75% of the over 600 killed in Gaza are civilians. Israel, for its part, has said that it has shown "unimaginable restraint," and is only interested in ensuring security for its citizens. 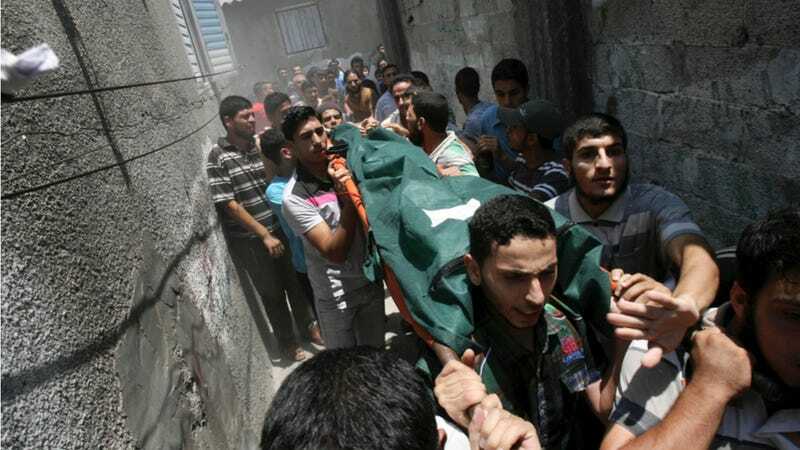 So far, more than two dozen Israeli soldiers have been killed, and two Israeli civilians. For what it's worth, I haven't yet seen an official estimate from the Israeli side of the civilian death toll, though calls to the Israeli Embassy have confirmed they are working on putting one together. Each side will accuse the other of bias, of being misleading, or of being outright liars. Obviously, I'm not going to use this platform as a podium from which to laud the 'just decision of going to war,' or to 'denounce a horrific invasion by an occupying force.' For all of the work we do here, I'm not sure Israeli Prime Minister Benjamin Netanyahu or Hamas leader Ismail Haniyeh are reading Foxtrot Alpha, so that would be pointless. But in a world where many feel that no one side can be wholly trusted, the next best thing is to get the data yourself. Luckily, Al-Jazeera has made that possible. The Qatar-based news service has kept a running tally of the dead, listing their names and ages, since the start of Israel's Operation Protective Edge on July 7th, in response to rocket fire from the Gaza Strip. It is provided by Ashraf al-Qedra, a spokesman for the Gaza health ministry. It is not completely up-to-date. As of this writing, the list itself was updated two days ago, which is not ideal for our purposes. It only lists 370 Palestinians dead, as opposed to the over 600 that are said to have been killed in total. But as the conflict continues as what looks to be a stalemate, it's reasonable to assume that the ongoing trends would continue. Unfortunately, the list itself doesn't go beyond names and ages. It doesn't say who these people were, what they were doing when they were killed, their political affiliations or actions. But their names and ages can still be useful for sussing out trends, because those two bits of information can tell us another important story, which is how many of them are males of military fighting age. Again, it is imperfect. Not all fighters in Gaza are males, nor are they all of military fighting age, which is given by the CIA World Factbook as ages 16-49. To hedge a bit, my methodology just counted those dead with male names, ages 17-45. Names like "Muhammed," "Saddam," and "Abdel," can reasonably be assumed to be male. Names like "Salima," "Walaa," and "Laila," can reasonably be assumed to be female. Those out of the age range of 17-45 were not counted in my methodology, nor were those with typically female names. If a name was unidentified, or an age not given, it was assumed to be outside the range. In addition, one of the few things I can definitively say about the conclusions we draw is that being both male, and of military age, does not a fighter make. Just as well, Hamas fighters often are completely non-uniformed, battling in civilian clothing. And many of the fighters may not even be strict members of the Hamas hierarchy. From the Al-Jazeera list, I found that 223 people, out of 370 people, were males of military age. That means that roughly 60% of the those killed were males of military age. That's alright, but we can also compare it with other statistics, and see if we can draw any conclusions from that. The CIA uses a more liberal estimate of males available for military service than my own, using the (broader standard than our own of) ages of 16-49. Of the men available for military service, it says that 335,820 are fit for duty. We can compare that to its 2014 estimate of the Gaza Strip's total population of 1,816,379, which would tell us that a little over 18% of Gazans are males fit for military service. Which means that of those killed, the number of males of military age is much higher than expected if Israel was killing indiscriminately, and it certainly throws the UN figure of a 75% civilian death rate into question. If 75% of those killed were civilians, a more even demographic figure among the dead would be expected. But what about Israel's claims of precision and restraint? One way to assess those claims is to compare the current conflict to similar wars involving Western powers. Israel and the UN aren't the only parties that give wildly disparate claims of civilian death rates, however. When NATO launched a massive air campaign against Yugoslavia in 1999, NATO said the civilian to combatant death ratio was 1:10. The Yugoslavian government gave their own estimate at the time, of 4:1. Human Rights Watch said that as many as 528 civilians were killed, and the Yugoslavian government said that 638 of its combatants were killed, giving us a figure of roughly 3.25:4. But the NATO bombing of Yugoslavia is probably not an apt comparison in terms of statistics, as it was limited to an aerial assault, rather than the ground campaign that is now underway in Gaza. A better comparison would probably be the War in Iraq, with its urban combat and non-uniformed fighting. An estimate of the death toll in the country by the organization known as Iraq Body Count would put the number of total dead at 174,000 from March 2003 to March 2013. Of those, 39,900 are said to be combatants, with the remaining 134,100 said to be civilians. That would give us a civilian to combatant death ratio of approximately 13:4. Those numbers, obviously, do not take into account the current rise of ISIS. So does Israel display unimaginable restraint, or does it participate in the wholesale slaughter of innocents? Neither, which is perhaps unsurprising. But when it comes to comparing it to similar wars, we might be able to say they're doing better than most.